Each December, this mycologist, or fungi expert, dresses up as Santa and drags a sledge behind him to deliver seasonal lectures on the fly agaric. The costume helps Harding drive home his point, for he believes Santa’s robes honour the mushroom’s red cap and white dots. Commonly found in northern Europe, North America and New Zealand, fly agaric is fairly poisonous, being a relative of other more lethal mushrooms, the death cap (Amanita phalloides) and destroying angel (Amanita virosa). 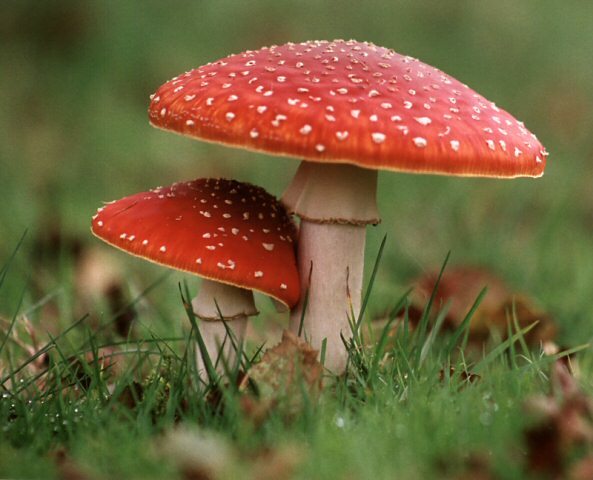 The hallucinogenic properties of fly agaric are derived from the chemicals iobotenic acid and muscimol, according to the International Mycological Institute at Egham Surrey. Ibotenic acid is present only in fresh mushrooms. When the mushroom is dried it turns into muscimol, which is ten times more potent. In traditional Lapp societies, the village holy man, or shaman, took his mushrooms dried – with good reason. The shaman knew how to prepare the mushroom, removing the more potent toxins so that it was safe to eat. During a mushroom-induced trance, he would start to twitch and sweat. He believed that his soul left his body, taking the form of an animal, and flew to the other world to communicate with the spirits, who would, he hoped, help him to deal with pressing problems, such as an outbreak of sickness in the village. With luck, after his hallucinatory flight across the skies, the shaman would return bearing gifts of knowledge from the gods. ‘Hence the connotation of the gift of healing, rather than something from the shops, as it is today’, Patrick Harding says. The villagers were also partial to the mind-expanding yellow snow because the muscimol was not greatly diluted – and was probably safe- once it passed through the shaman. In fact, ‘There is evidence,’ says Harding, ‘of the drug passing through five or six people and still being effective. This is almost certainly the derivation of the British phrase “to get pissed”, which has nothing to do with alcohol. It predates inebriation by alcohol be several thousand years.’ Such was the intensity of the drug-induced experience that it is hardly surprising that the Christmas legend includes flying reindeer…. still getting squared away. but seems a good fit. internet still not sorted. visiting and using wifi. bit of JD honey to keep warm and try to catch up with all. … and there are boxes (and boxes) to go before i sleep. if we truly see the world. A fierce and terrifying band of samurai. Unbound Boxes Limping Gods: Disconnected Stories. Issue # 33: Amanojuko Part 1.
via 3) My Kitchen at Midnight.